Under the scorching heat of the summer day, if a breeze starts and passes rows of candock over clear waters, you would feel that their flowers are like fairies on waves, and you would feel quite relaxed and happy. Candock is a vivacious herb. Its leaves and flowers all float over the water surface. Its leaves are round like shields; the color of the leaves is green on the surface and purple on the back. Its flowers are rich in colors, such as white, red, pink, yellow, blue and purple, and its blossom period is from June to August each year. Each flower could blossom 4 to 7 days, and would fall into the water to give fruits after withering away. 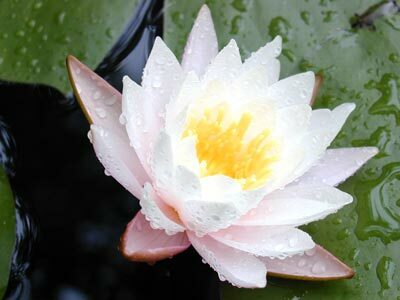 The academic name of candock is Nymphaea(Nymphaea), meaning a fairy living in the water; in ancient Greece and Rome, candock, just like lotus in China, was regarded as the embodiment of beautiful and holy things, and was often used as the sacrifice to Goddess. In the Bible, candock was also deemed as a "holy and pure" object. The people of ancient Egypt began to transplant candock as early as in over 2000 years ago and they regarded it as the symbol of the Sun. They believe candock was a holy flower, and they use the flower in the coronations and its patterns in carvings and frescos etc. candock is used for ornaments in the construction of gardens quite early, as early as 2000 years ago, we could see its trace in the private gardens in Han Dynasty of China. In the 16th century, the Italians regarded it as the major material for establishing water landscapes. Since it could absorb the toxic substances in water, such as lead and mercury, it is a good material for purifying water; and it is extremely set store by people in water purifying, forestation and constructions. Candock usually opens at noon and closes up at dusk. A poet once wrote: "Don't misunderstand us, we don't like to sleep, we are not happy to see the dusk; we close up during the night, and we open up before the dawn; we get up early to greet the dawn and the morning sun." Candock originates from tropical areas in North Africa and Southeast Asia, and a few varieties originate from South Africa, Europe and the moderate zone of Asia. For the time being, they are planted in almost all the provinces of China. The lotus roots are eligible and could be used for brewing liquor as well as making medicines.